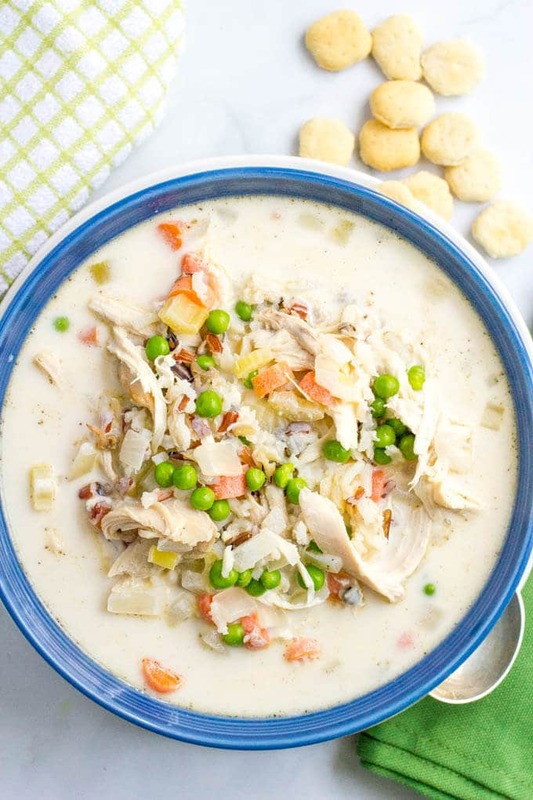 Healthy creamy chicken and wild rice soup is filled with veggies and deliciously creamy while still being very light. Plus the recipe is ready in just 30 minutes! I’ve been having the loveliest of weeks so far and I hope you have, too! I’ve got the week off of my day job as a health and nutrition editor, so apart from catching up and getting things holiday ready, I’ve had lots more time to slow down and play and relax. And I’m trying to give myself permission to do just that! This month for the Recipe Redux theme, we were challenged to a little cookbook game. We had to use the numbers in 2016 to find a recipe in one of our favorite cookbooks. 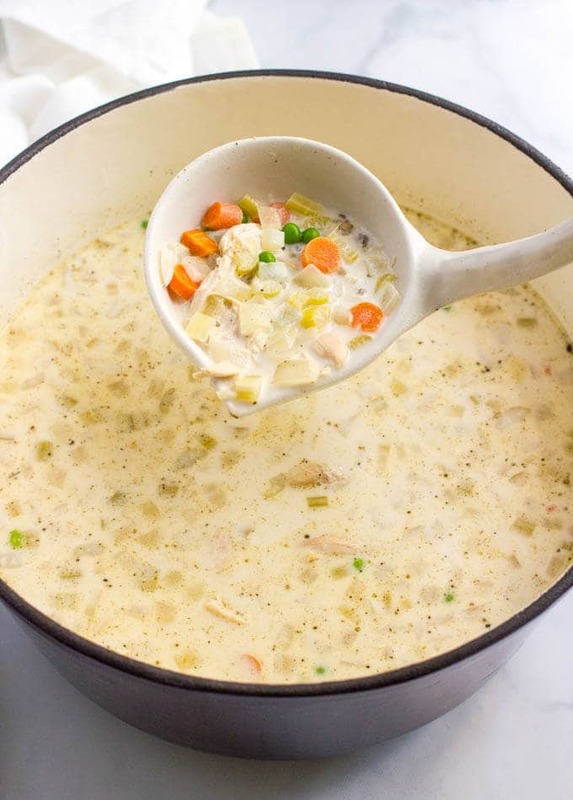 I’ve made this healthy creamy chicken and wild rice soup a few times already this fall and tweaked the original a bit. 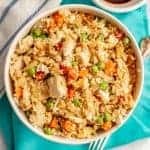 I used chicken instead of turkey, I used a regular onion instead of green onion, I skipped the bacon and sherry, added peas and doubled the amount of rice – it needed it. I love the pop of color and brightness from the peas, but you could go without if you aren’t a pea fan. You can use leftover roast chicken or pick up a rotisserie chicken from the store. Or use leftover turkey, as the original called for. I use white whole wheat flour (cause that’s what I always use) but you can use regular all-purpose flour or substitute a gluten-free flour if you want to make this a gluten-free recipe. I, who loves all the toppings, generally just add salt and pepper to this at the table. 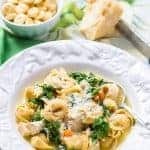 But you could dress it up with some chopped fresh parsley, grated Parmesan cheese, a few dashes of hot sauce, even a sprinkling of cooked, crumbled bacon. My husband also likes having it with oyster crackers. You could serve it with some good bread or biscuits as well. 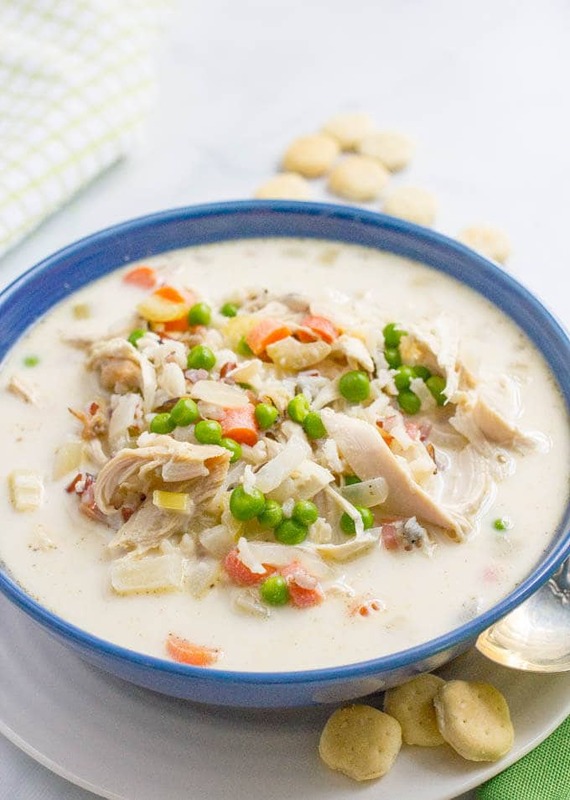 I hope you give this creamy chicken soup a try – it’s a quick + easy meal that brings all the comfort and will warm you right up on a chilly night. Wishing you a warm and merry Christmas – or just a lovely relaxing weekend if you don’t celebrate the holiday. I’ll be back next week with more deliciousness. (Sign up here for my free e-newsletter so you never miss a recipe!) And be sure to check out the other cookbook-inspired recipes below from my fellow Recipe Reduxers. Check out the VIDEO I made so you can see how easy this recipe is! 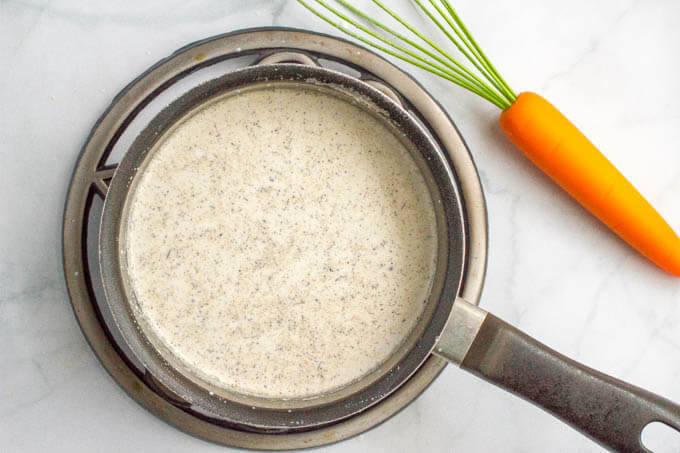 A 30-minute soup filled with veggies and deliciously creamy while still being very light! Combine chicken broth, water, wild rice, onion, carrots and celery in a large stockpot over high heat and bring to a boil. Reduce heat, cover and simmer for 15 minutes, or until rice and veggies are tender. Add salt, pepper and poultry seasoning and stir to combine. Slowly add half-and-half while whisking constantly to remove the clumps and get a smooth mixture. Cook the cream mixture for 4-5 minutes, until slightly thickened, stirring occasionally. Slowly add the cream mixture to the cooked rice, stirring to combine. Stir in chicken and peas. Cook for 2-3 minutes, until everything is warmed through, but don’t let the mixture boil. Serve hot and enjoy! I love the pop of color and brightness from the peas, but you could omit them if you prefer. You can use leftover roasted chicken or pick up a rotisserie chicken from the store. Or substitute leftover cooked turkey. I use white whole wheat flour (cause that's what I always use) but you can use regular all-purpose flour or substitute a gluten-free flour if you want to make this a gluten-free recipe. Optional toppings include chopped fresh parsley, grated Parmesan cheese, a few dashes of hot sauce, even a sprinkling of cooked, crumbled bacon. I just listened to a fascinating podcast on how wild rice is harvested in Minnesota on Splendid Table. I’ve been craving wild rice since. Totally going to make this for my family! Oh I love that show on NPR! And I love, love wild rice! Oooh I want to make this all winter long! Your days with the kids sound very much like mine, except the working out part…. 🙁 They have holidays as well starting today. I love this kind of creamy chicken rice soup, it is something my kids would eat at any given moment. Pinned! I wish a Merry Christmas! Thanks so much Adina! I hope you and your family have a happy holiday! 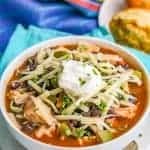 Tis the season for yummy soups! Love this recipe! I’ve been cooking soups non stop lately. Always looking for new ones for rotation! Trying this next! Yum! ‘Hope y’all have a Merry Christmas!! That’s great – I’m loving soup season too! Hope you guys had a wonderful Christmas! Miss you! 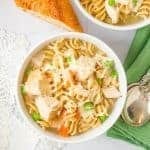 I love how quickly this soup can be made! Yes! 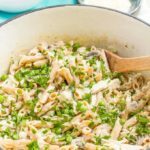 Perfect for a quick + easy winter weeknight dinner! This really looks incredible. Love how easy and healthy this is! Love the addition of the peas! Thanks! 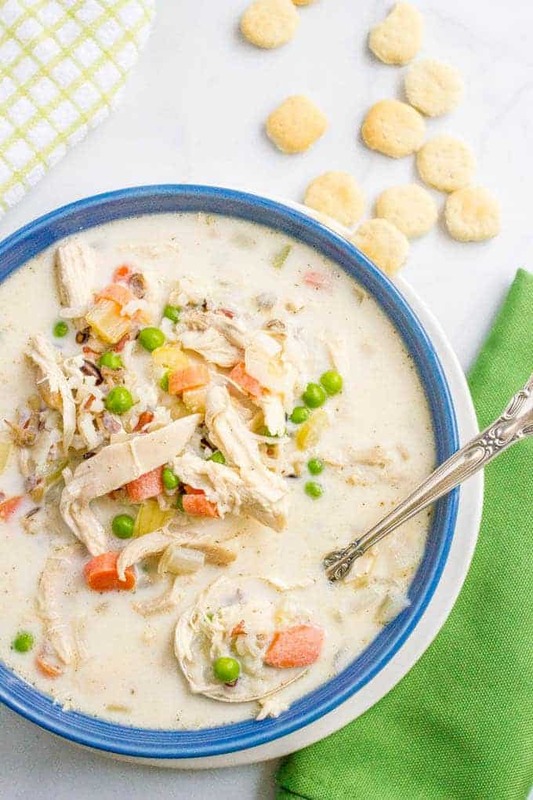 They add a great pop of color and touch of sweetness to this soup! Looks so good and hearty! Love a warm and cozy soup! This sounds like the perfect winter dinner! 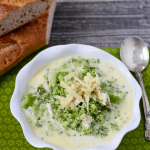 How nice to have a healthier option for such a great soup!